selection process was an adventure. Three earlier trips had been very different, but shared common elements we love: (1) visiting beautiful geographic locations, (2) swimming in warm ocean water, (3) snorkeling among colorful fish, and (4) sailing! In less than a year we had already experienced three wonderful voyages as part of the Sunsail owners program! I called John Keyes at Sunsail, and learned that a Jeanneau Sun Odyssey 36i was available in St. Vincent, and had John put a “hold” on that sailboat. Within an hour I had booked the flights via Expedia, called John back to make firm reservations, and paid the fuel and turnaround fees (a total of approximately $350) with a credit card. Done! Over the next week I ordered Sailing Guide to The Windward Islands by Chris Doyle, and re-read the classic A Cruising Guide to the Lesser Antilles by Donald M. Street. 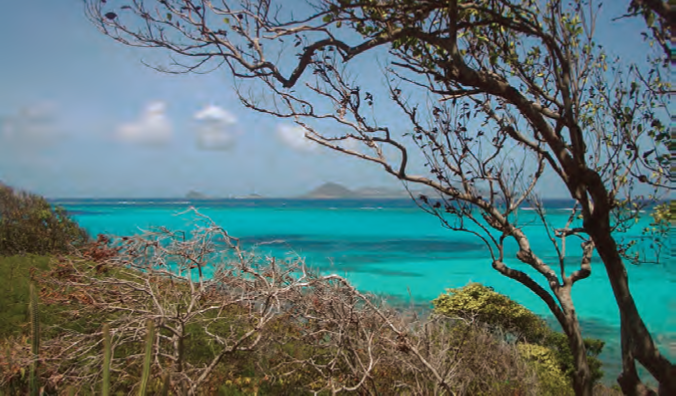 Although written 40 years ago, Street’s vivid descriptions of the Grenadines are wonderful and, plate tectonics notwithstanding, the islands are all still essentially in the same place, give or take a few feet. Getting to the former Sunsail base at the Blue Lagoon near Kingston, St. Vincent was an adventure! (Note: Sunsail has since moved the base, and charterers now sail out of Rodney Bay, St. Lucia to visit St. Vincent and The Grenadines). There are no direct flights to St. Vincent from the US, so we flew from Providence, RI to Philadelphia, connected to Bridgetown, Barbados, and finally after a long line to clear customs, we flew “back” to St. Vincent, arrived, cleared customs again, and took a cab to the Sunsail base. The night watchman was alert to our late arrival and showed us to the Jeanneau 36i Black Pearl, documented out of Nice, France. We had Sunsail pre-provision all beverages in advance, so we unpacked and sipped rum and tonics in the cockpit, with ice from Sunsail. Terrific! The tension of an 18-hour trip drained away. Nancy and I smiled. It was 75° F here and probably 15° F at home. The wind blew at 15 – 20 knots all night, so there were no mosquitoes. We both slept wonderfully. Sunday morning was Valentine’s Day. Warm sun and turquoise water were wonderful mutual presents. After breakfast we took a cab to a local supermarket, bought provisions for two weeks, returned and attended the chart briefing. As we had not sailed in these waters, we wanted to learn about any problem spots. 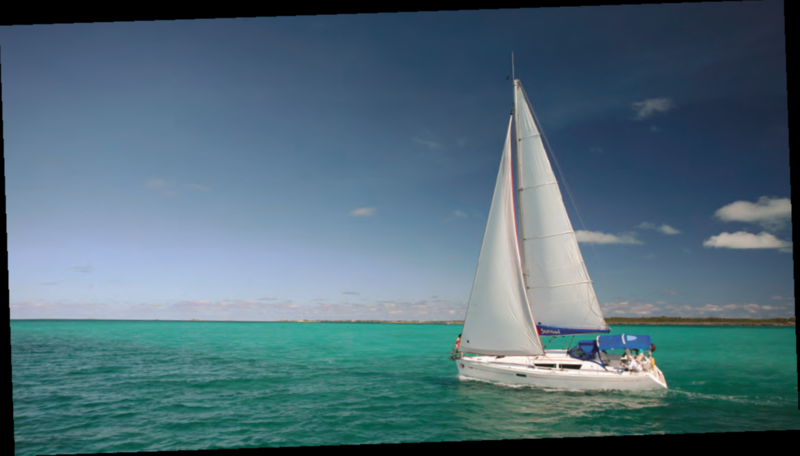 Sunsail describes this as a “Level 3” sailing area (vs. “Level 1” for the BVI), so sailing skills such as reefing, anchoring, allowing for set, and steering in bigger seas are required. 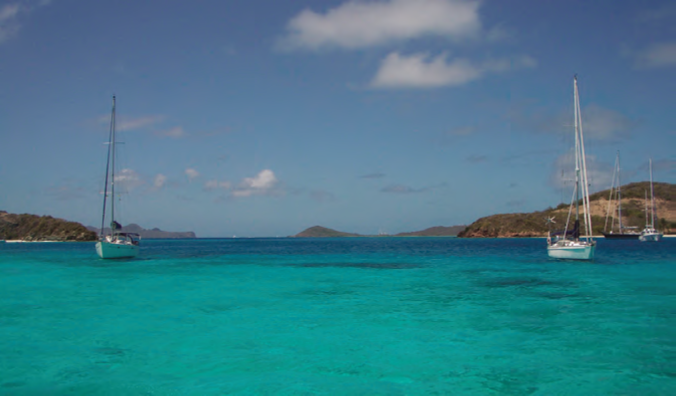 Passing from one island to another in the Grenadines, you are sailing in the open Atlantic Ocean. The waves are bigger, the winds stronger, there are currents, and you cannot duck behind the lee of an island when caught in a blow. We learned that there are numerous unmarked coral heads in the Tobago Cays, and the ocean currents can shift the bottom sand in places. Use the GPS chartplotter and especially your eyes, as water color tells a true tale about water depth. We left the Sunsail dock at 1 pm, powered into deep water, raised the mainsail, unfurled the genoa, cut the engine, and sailed on a port tack close reach towards the west coast of Bequia (pronounced “beck-way”) at about 6.5 knots. The wind was ESE at around 15 knots, the water was bright blue with numerous whitecaps, and we were in heaven. This definitely beat shoveling snow! Three dolphins swam near our bow (presumably a harbinger of good fortune), and we soon rounded the entrance into Admiralty Bay on Bequia, dropping the anchor in 11 feet of crystal clear water. Admiralty Bay is large, well sheltered from the prevailing easterlies, and has abundant room to anchor. The water temperature was 79° F, and after departing snowy Rhode Island in February, was absolutely fabulous! We put on snorkels, masks and fins and swam to check the Delta anchor, which we found buried in the soft sand. Later that night we heard the unique Caribbean sounds of a steel band emanating from the shore. Our nearest neighbor was about 200 feet away so no matter how the wind might back or veer during the night, having set 120 feet of chain there was little danger that we would ever hit anything other than wind and waves. Nancy sautéed Panko chicken and bananas, served with brown rice and butter, fresh green beans, and a bottle of chilled Sauvignon Blanc. After sunset I spotted the big dipper, used the twin pointer stars to find Polaris, and looking back along the arc of the handle located Arcturus. The Milky Way formed a brilliant swath across the tropical night sky, an 8-10 knot breeze kept the mosquitoes away, and the gentle rocking of the hull was hypnotic, so we were asleep by 10 pm. We returned with fresh fruits and vegetables for 50 EC or $19, and took the dinghy back to the Black Pearl. It was 4 pm, so we snorkeled off Princess Margaret Beach. The next morning we were awakened at 7:30 am by Makati selling baguettes and…block ICE! Two baguettes were 10 EC, and he said he would return with the ice at 8:30 am. At 8:45 am we were ready to weigh anchor, but there was no sign of Makati. Finally, at 10:30 we could wait no longer, and set sail to Canouan in 18-22 knot easterlies, with 5-7 foot seas once out of the lee of Bequia. A first reef in the mainsail helped, but we were still heeled at 20 degrees. We arrived at Canouan around 1 pm, anchored, and I swam to check the anchor, which was fine. Swimming actually felt good. I had no pain with normal motions, but twisting from side to side definitely got my attention. A key thing to check would be if I had any blood in my urine. Fortunately, the next few times nature called, all was well. The take-home lesson here is that while standing and steering a Jeanneau 36i in big seas, one hand should be on the wheel and the other on the curved binnacle guard.Unfortunately, I then picked the wrong instant to stand up to check the knotmeter. As I stood we were hit with a large wave off the port quarter, which suddenly increased heel angle, hurling me to starboard. Rather than holding onto the secure stainless binnacle guard with one hand, I had both hands on the wheel, which promptly turned clockwise. I slammed into a piece of teak near the aft starboard coaming, hitting my right side near my kidney. The pain was sufficient to take my breath away for 10 seconds. I knew I would get a nasty black & blue mark, but was really hoping that there was no internal bleeding. I took two Tylenol. I am sure Tylenol helped, but moving about, swimming, and being active further reduced the pain. Also, if I am ill or injured my body goes into “deep sleep mode.” After a long night’s sleep, I awoke feeling much better. We finally got more ice, and then departed Canouan for Salt Whistle Bay on Mayreau Island, in a 20-knot easterly, with 4-6 foot seas. We sailed on a beam reach at 6.5-6.7 knots, and soon left Catholic Rock astern to starboard, and entered the incredibly picturesque Salt Whistle Bay, which looks like a postcard! The guidebook stated that this anchorage can properly hold a dozen yachts, but we counted as many as 29! With little draft, six catamarans were anchored within a boat length of the beach. Slowly motoring, while using the GPS and the color of the water to avoid two nasty reefs, we found a nice spot in 9 feet of water, not too close to any other boats, dropped the anchor, let out about 100 feet of chain, and then swam to check that the anchor was well set in the white sand bottom under crystal clear water. Nancy had spent much time cooking in the galley, so it was time to give her a break. 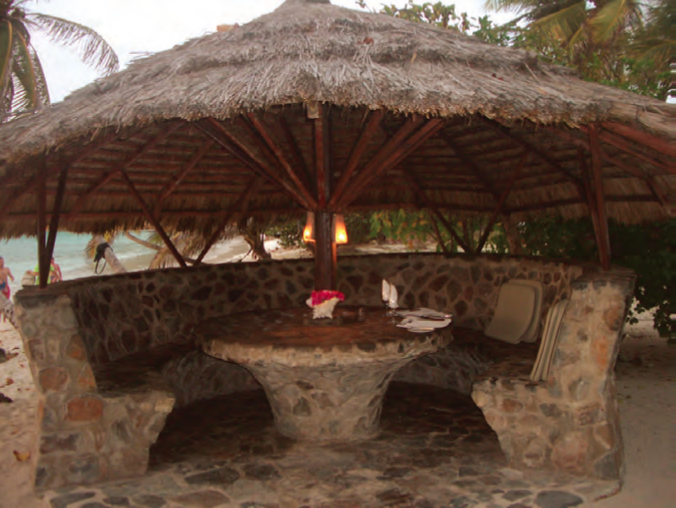 Mayreau actually has an elegant little resort with a restaurant right on the beach at Salt Whistle Bay. I made reservations and pre-ordered our meals for dinner that evening. We snorkeled, showered, put on clean shorts and polos, took the dinghy to the beach and walked less than 50 feet to the outdoor dining area. Here was a magical spot with a stone table and seats, with cushions, under a thatched roof, with impeccable service, white linen, fine china, candles, and wine glasses, adjacent to tiny wavelets lapping a soft sand beach! We expected a camera crew to step out at any moment and announce that they were filming a movie. Facing the harbor as the sun was setting; we had grilled fresh lobster tail, rice, peas, and a splendid salad with a wonderful chilled bottle of Vouvray. This was a memorable evening in an extraordinarily beautiful place with my beloved. It is at times like these that I realize that I am a very fortunate fellow. We woke early on Thursday, weighed anchor and, as the distance was short, simply powered around the NW corner of Mayreau and then about 2 miles to the opening between Petit Bateau, and Petit Rameau in the Tobago Cays, anchoring off the turtle sanctuary at Baradel in 9 feet of clear water, with a white sand bottom. It took us about one minute to decide that this was, up to this point in our lives, the most beautiful place we have ever sailed! It is impossible to describe the incredible array of water colors: from dark blue in the ocean beyond Horseshoe Reef, to azure blue slightly closer to the reef, to cerulean blue closer still, to turquoise, then to lime green in the shallow water, and finally utterly transparent “gin” in the very shallow water over white sand. Baradel is home to a sea turtle sanctuary, so there were many turtles swimming about in the gorgeous water. Nancy loves sea turtles, and especially the way they pop their heads out of the water, glance at you, and then gently slip below the ocean surface, hold their breath, and resurface a hundred yards away. They are very shy, and one is fortunate if a sea turtle will allow you to get within 10 feet. Exercising great patience, Nancy finally got fairly close to one and described it as about 2.5 feet long and very beautiful, with striated markings. The “boat boys” provide great service in the Tobago Cays. Nancy bought two croissants, a hand-dyed tee shirt, and ordered ice and fresh baked banana bread from “Mr. Quality,” to be delivered at 7:30 am. The boat boys travel 7 miles to Union Island and 7 miles back, using much gasoline to operate their skiffs, so their prices are a bit higher than those ashore, but their service is excellent and very convenient…and where else were we going to get ice? 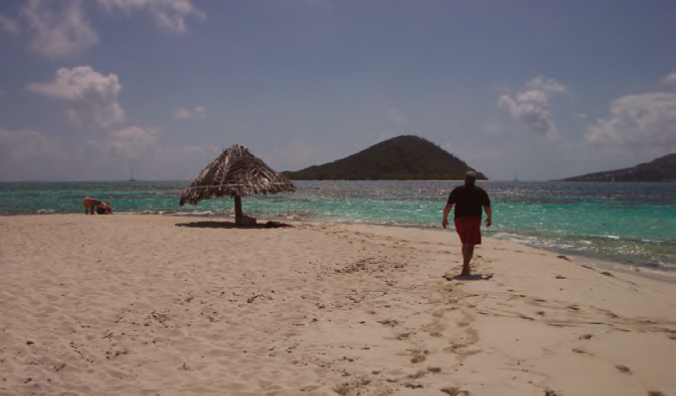 We later circumnavigated Jamesby Island, one of the five Tobago Cays, by dinghy. The colors of the ocean nearby and beyond Horseshoe Reef were astonishing. We then did the same with Baradel Island. We are fortunate to experience all this natural beauty. When we are old and cannot do this, I suspect we will sit in our rocking chairs, look at the photographs and think back to these very special times. We both believe that now is the time to do this, while we still can! On Saturday at 7:32 am, “Mr. Quality” arrived as promised. We had delicious toasted banana bread & butter. After breakfast, we cleaned up, weighed anchor and sailed to Union Island to re-provision, as we were drinking much water, iced tea, fruit juices, beer, tonic and rum in the tropical heat. Union Island has a well-marked harbor, but there is a reef on one side and some wreckage in the middle. We docked near Clifton’s Hotel, and were greeted by “The Pope,” who helped secure our bow line and watched the boat for 20 EC while we shopped. “The Pope” told us to get our fruits and vegetables from Jenny, who he said has the freshest produce on the island. He then asked what type of rum we liked. We told him Mount Gay or Pusser’s. For 20 EC he would get us a quart of the local rum made on Union Island. I gave him 20 EC and we headed to Jenny’s fruit and vegetable stand, where we were soon laden with fresh pineapple, grapefruit, papaya, bananas, tomatoes, and colorful red peppers. After returning, “The Pope” handed me a bottle of the local 170-proof rum. I thanked him and gave him an additional 20 EC for all his help. He then untied the bow line and helped push the Black Pearl off the dock against a 15-knot beam wind, waving us a very friendly goodbye with a big smile. What a delightful fellow! Leaving Union Island, this Union College graduate and his beloved set sail for the little island of Petit Saint Vincent or “PSV,” which is nearly surrounded by reefs, so caution was appropriate. Anchoring at PSV was tricky as the water was either very deep or quickly rather shallow. With help from the cruising guide, the GPS and our eyes, we finally dropped the anchor just on the edge of an 8 feet deep, sandy patch covered by turquoise water, and let the hull get blown back by the wind into 15 feet. The guidebook advised that to visit Mopion, it was best to leave the mother ship at PSV and take the dinghy past the reefs. Itty-bitty Mopion has zero vegetation, and includes a single thatched umbrella on which some salty survivalist tied a string with a bottle opener to a single nail pounded into the trunk of the umbrella! Mopion, which means “the bedbug” in the Caribe dialect, looks like a cartoon version of the proverbial deserted island. This concludes the first portion of our adventure in St. Vincent & the Grenadines. • Allow more than two hours of layover in Barbados! • The “boat boys” are often very helpful. • The Tobago Cays are glorious!!! • Reef a Jeanneau 36i when going to weather in over 18 knots of apparent wind. • When standing at the helm in big seas, keep one hand on the curved binnacle guard! • Bring insect repellent when going ashore! • Watch out for Union Island rum! Nancy Kaull, a native of Newport, RI, and Paul Jacobs, who was born in New York City, have been sailing together for 12 years This article is excerpted from their forthcoming book Voyages. Since 2009 when they purchased the Jeanneau Sun Odyssey 36i Sandpiper, based in Tortola, BVI, Nancy & Paul have sailed as part of the Sunsail owners program in Abaco, Bahamas; Tortola, St. Martin, St. Barths, St. Kitts, Nevis, Anguilla, St. Vincent & the Grenadines, Granada and Carriacou in the Caribbean; Dubrovnik, Croatia, Tugutreis, Turkey and Vounaki, Greece in the Mediterranean; and Raiatea, Tahaa, Huahine, Bora Bora and Maupiti in French Polynesia. They reside in Saunderstown, RI. Special thanks to Daniela Clark at TUI Marine for her assistance with this article.